The BM25 portable gas monitor is designed for team protection or area monitoring where fixed detection systems are not suitable. The unit is useful in applications like perimeter monitoring and plant shutdowns for use by maintenance teams. 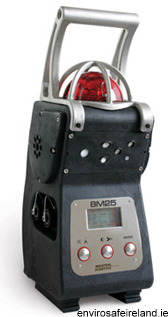 The BM25 packs the benefits of a fixed-system area monitor into an easily transportable, yet rugged instrument, which is capable of area monitoring up to 5 gases through diffusion or sample draw to protect response teams or maintenance teams in high gas-risk areas during on-site work, shutdowns or short-term maintenance. This makes the system easily adaptable to a variety of applications and industries such as the chemical, pharmaceutical, refineries and water treatment industries as well as any work in confined spaces. There are now 32 interchangeable “smart” sensor options available for the BM25 Area Monitoring system including a PID sensor for VOCs, an IR sensor for CO2 and combustible gases, electrochemical sensors for toxic gas and oxygen detection, and a catalytic sensor for combustible gas detection. When the BM25 Area Monitoring system detects a hazardous level of oxygen, toxic or combustible gas, the top-mounted beacon sends a flashing, bright signal in all directions while emitting a powerful, 103 dB siren alarm. The BM25 comes standard with a high capacity nickel metal-hydride battery pack offering up to 170 hours of continuous runtime. Long-term area monitoring is possible in hazardous locations with an intrinsically safe trickle charge power supply. Also standard are STEL and TWA readings and almost four months of datalogging capacity for a five-gas configuration.